An extremely interesting man by the name of Fredrick Burnaby, a British Officer from the 19th century wrote a travelogue called “On Horseback Through Asia Minor” which is wonderful read. The Russians who were contemplating war with Turky thought he was a spy and as much time as he spent inspecting and measuring forts and gun emplacements seems to be good evidence that he was. He was also a theological observer. When told that the Trurks were going to get some Martini rifles and saw them only practicing manual firing exercises he reports this conversation. Fatalism seems to be a big part of Islamic theology. “Inshallah”, which means “if God wills”, is uttered by everyone of that faith at every turn or event in life. There is also a Bedouin saying that we should “trust in Allah” but tie up our camels”. 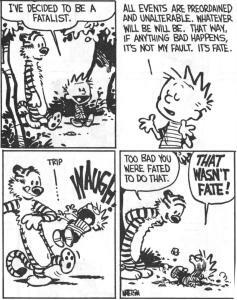 The idea of fatalism is something that crops up all the time – “what will be will be”. We hear it in hospitals before surgery’s and in many places where major decisions need to be made or maybe not made. It is once again the consequence of the belief that God is both all-knowing and all powerful, and that therefore all that happens, happens by necessity. At the same time we want desperately to hang onto the idea of free choice. Jesus says that he “must go up to Jerusalem to suffer and die”. Peter tells folks that these things “had to happen”. James says that we do not know what is going to happen and that we should add to our our words the phrase “if God wills”. I wonder where Mohammed got the idea and the phrase. This is an important topic when it comes to mission and mercy. What is the difference between fatalism and the trust in an all powerful God? We will talk about these things in future blogs. Not Failing, Faltering, or Flagging …….